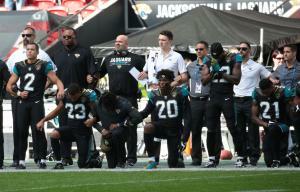 Sept. 24 (UPI) — Current players, a coach, a hall of famer and a billionaire team owner all participated in a national anthem protest before the Jacksonville Jaguars and Baltimore Ravens game in London. The protest took place Sunday morning at Wembley Stadium. The owner taking part was billionaire Jacksonville Jaguars boss Shahid Kahn. Ravens coach John Harbaugh and Hall of Famer Ray Lewis also took part. Similar protests are expected throughout Sunday’s full slate of games following several statements from President Donald Trump regarding NFL players taking a knee during the national anthem. On Saturday many NFL owners and players and commissioner Roger Goodell offered statements in opposition to the comments from the President. More owner statements came on Sunday, including more from Kahn after he decided to stand on the sideline, locking arms with his players. Kahn contributed $1 million to President Trump’s inaugural committee. New York Jets owner Woody Johnson, Patriots owner Robert Kraft, Washington Redskins owner Dan Snyder, Houston Texans owner Bob McNair, Los Angeles Rams owner Stan Kroenke, Tampa Bay Buccaneers owner Edward Glazer also contributed to Trump’s inauguration. President Trump composed more tweets on Sunday about the NFL and its players. “If NFL fans refuse to go to games until players stop disrespecting our Flag & Country, you will see change take place fast,” Trump tweeted. “Fire or suspend! “…NFL attendance and ratings are WAY DOWN. Boring games yes, but many stay away because they love our country. 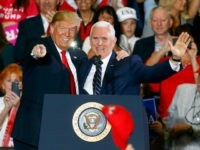 League should back U.S.,” Trump wrote. Kraft, McNair and Kroenke also made statements in response to President Trump’s comments on Sunday.